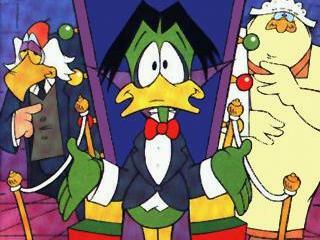 A vegetarian vampire duck transports his castle all over the world in search of treasure and fame as a musician. 37. 2-11                21 Nov 89   Whodunnit? Thanks for their valuable contributions to Alan Morton, Andrew Morrice, Jeremy Legat, Jennie Filer, Brian Walton, Alexandre Mah, Elaine Lawrence and Stacey Smethurst.